Shelves full of bottles of different perfumes on display at La Source Parfumee in the village of Gourdon in Provence, France in Europe. La Source Parfumee is an intriguing place to visit located in the charming village of Gourdon in the mountains of Grasse in Provence, France in Europe. The finest essences are obtained from naturally grown alpine flowers which are treated to make the different aromas of these perfumes.La Source Parfumee is open 365 days for people to come and check out the perfumes and discovery all the Lavanderies and aromatic plants in their flower fields. Before you even enter the doors of La Source Parfumee in Gourdon Village in Provence, France you get a smell of all the delicate odors of the different perfumes.This extraordinary shop in Gourdon Village is also a candle making workshop and an old Distillery so there are plenty of things to see on your shopping excursion.Bottles of perfume on sale at La Source Parfumee, Old Distillery and Candle-making Workshop in the Village of Gourdon at 760 metres in the Alpes Maritimes, Provence, France, Europe. 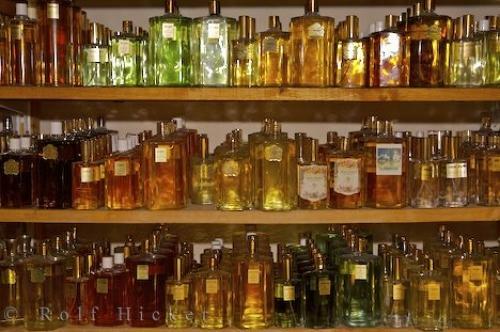 Photo of bottles filled with beautifully scented perfumes in Gourdon Village in Provence, France in Europe.